Just the other day in a Slack group I hang out in someone asked "what web design events is everyone going to and loving?" An Event Apart is always my immediate answer. I've gotten to speak a number of An Event Apart events, which is an incredible honor and always a good time. So from that perspective, I love it. I can tell you that it's the most well-run conference I go to that gets all the details right. But I've also attended An Event Apart as a paying attendee and loved that. There is something about An Event Apart that gets the speakers to really bring their A-game, and you get to watch that A-game over and over for a couple of days. Learn from the best: An Event Apart’s speakers aren’t merely industry leaders with years of experience and deep insight. They’re also engaging, inspiring thinkers who are passionate about sharing what they’ve learned and helping you level up your skills. And because our editorial team works closely with those speakers, you’ll find that each presentation sheds light on the next—that the event is not merely a collection of disparate talks, but a curated, cutting-edge curriculum for the modern designer, coder, and strategist. A curriculum that continues after the conference ends, with slides, articles, videos, and other resources shared freely on our website. 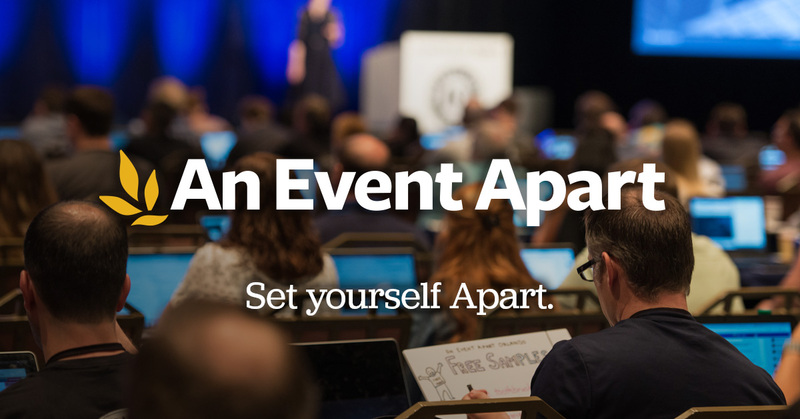 At An Event Apart, you won’t just learn what’s happening right now. You’ll also look ahead to what’s next. 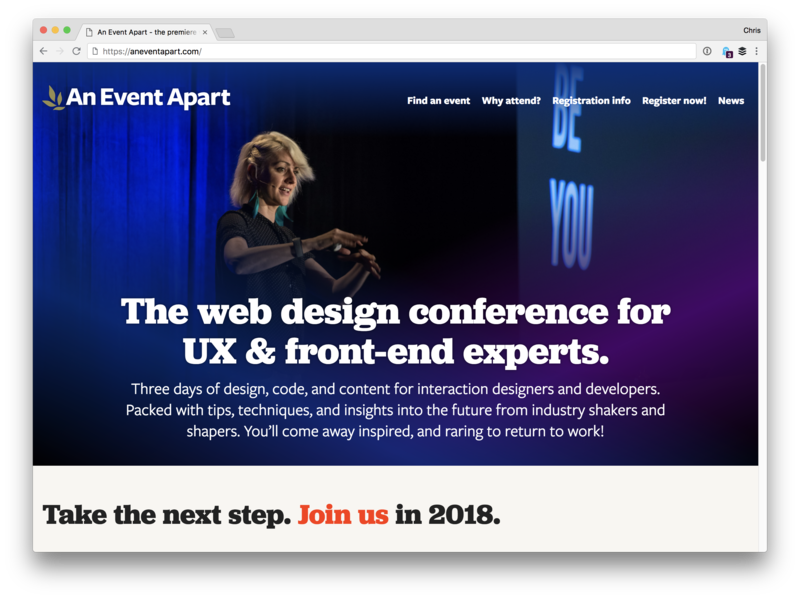 Topics people heard about on our stage before the rest of the industry knew they were coming: responsive web design, mobile-first practices, content strategy, responsive content strategy, and, now, intrinsic web design and variable fonts. Make sure to use AEACP to get $100 of any 2 or 3 day event!